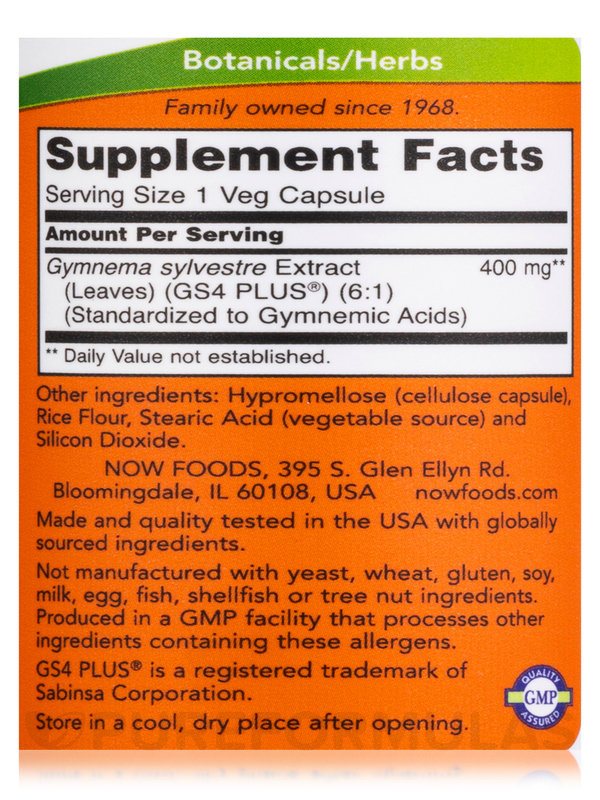 This Gymnema Sylvestre 400 mg by NOW is supposed to help with blood sugar so I have been taking it for several months and numbers are improving. My friend recommended Gymnema Sylvestrs by NOW to me. It does work. I rotated this product with the NOW Chromium Picanolate and it really works well to lower sugar cravings and stabilize blood sugar. I highly recommend. 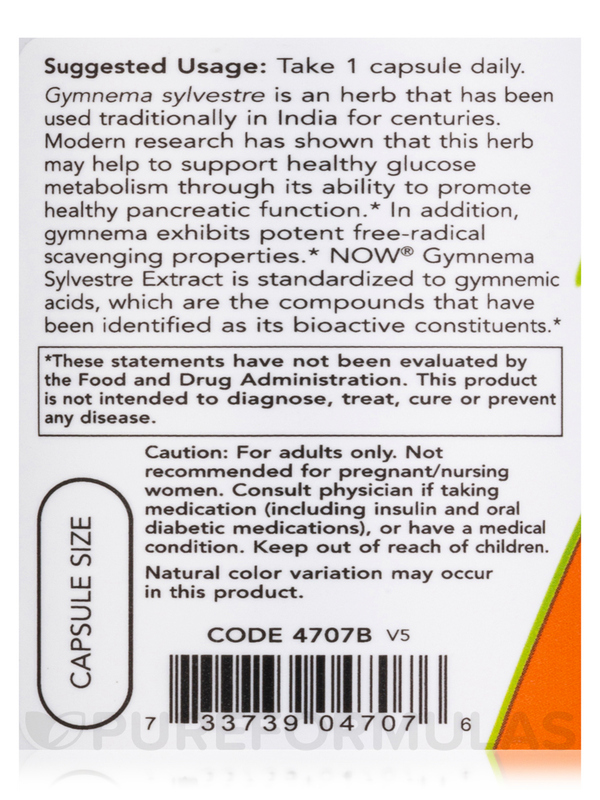 Gymnema sylvestre is an herb that has been used traditionally in India for centuries. Modern research has shown that this herb may help to support healthy glucose metabolism through its ability to promote healthy pancreatic function. In addition‚ Gymnema exhibits potent free-radical scavenging properties. 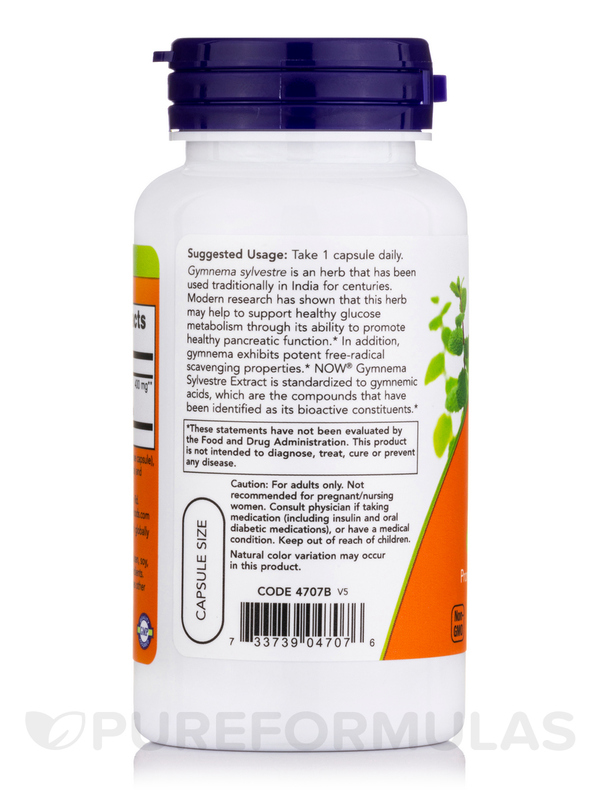 NOW® Gymnema Sylvestre Extract is standardized to Gymnemic Acids‚ which are the compounds that have been identified as its bioactive constituents. - Promotes Healthy Pancreatic Function. Not manufactured with yeast‚ wheat‚ gluten‚ soy‚ milk‚ egg‚ fish‚ shellfish‚ or tree nut ingredients. Produced in a GMP facility that processes other ingredients containing these allergens. 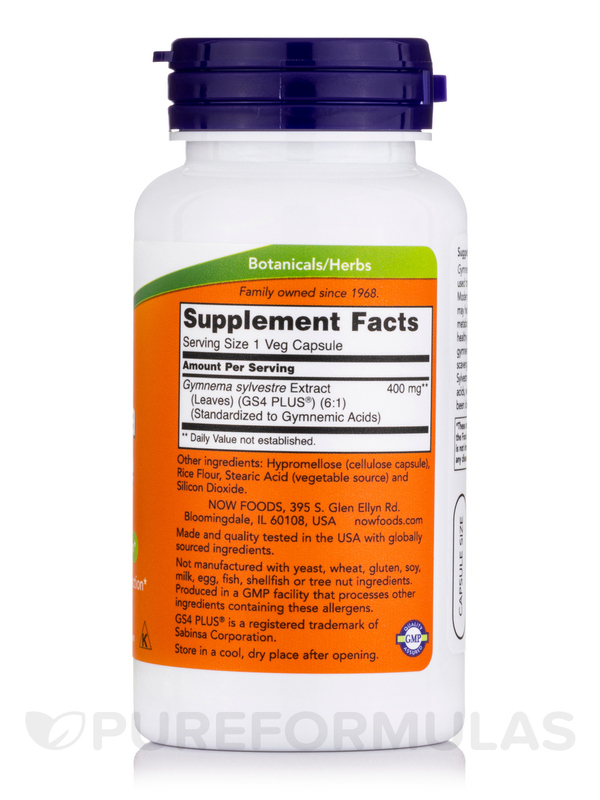 As a dietary supplement‚ take 1 capsule daily. Allergen Caution: Product not manufactured with yeast‚ wheat‚ gluten‚ soy‚ milk‚ egg‚ fish‚ shellfish‚ or tree nut ingredients. Produced in a GMP facility that processes other ingredients containing these allergens. 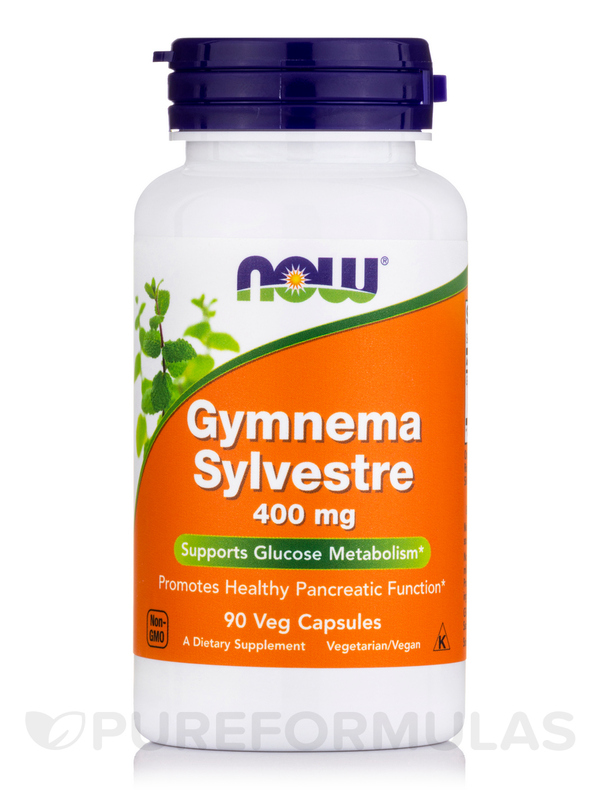 I didn't feel any difference when I took Gymnema Sylvestre by NOW. I had been taking a prescription drug to help control my blood sugar but it had troublesome side effects that were causing some problems for me. I had read good reports about Gymnema Sylvestre in several books and thought I would give it a try. I have had good experience with NOW products from PureFormulas in the past and it did not let me down with GS either. My blood sugar is lower than it had been with the prescription drug and I no longer have the troublesome side effects I had been having! It is inexpensive and it works! We noticed a difference in Gymnema Sylvestre by NOW vs. the generic. Really works and I trust this brand, great price too! My doctor recommended Gymnema Sylvestre when I was trying to lower my A1C and stop my sugar cravings. After a couple of months my A1C is 5.5 I do NOT crave sugar. I made it through the holidays without wanting anything sweet. I also take Ultra Chromium to help. You have been out of Now brand gymnema for months now. Do you ever expect to get this back in stock? Hello, thank you for contacting PureFormulas.comWe do have an order coming in soon for this product so I linked your email with the product, so oncewe receive it in stock you will receive an email notification. Hope you have a happy and healthy day.